Newgrange in Ireland is a magnificent megalithic tomb that channels the winter solstice sun through its uterine passageway. This place was connected with the sacred energies of the ancient Goddess long before the Celts arrived in Ireland. Built about 3200 BC and known as Brugh na Boinne, Bend of the Boyne, the great circular mound of earth and stone sits astride an elongated ridge in a large curve in the Boyne River about five miles west of the town of Drogheda. The Boyne, said to reflect the heavenly river the Milky Way, is named for Boand, the Celtic river goddess. Newgrange has a facade of sparkling white quartz stones, is surrounded by giant standing stones and ninety-seven kerb stones, and is richly decorated with megalithic art. At dawn on the winter solstice, a shaft of light penetrates the long inner passageway and illuminates the inner chamber. The passageway calls the fertilizing powers of the sun into the womb of the megalithic mound on the year’s darkest day. 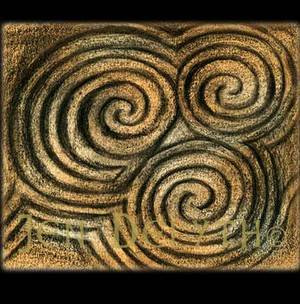 The entrance stone is covered in carved spiral forms, including the significant triple spirals that are among the most sacred symbols of Neolithic Europe, and that are so well known to us today. They offer a beautiful example of an archetypal symbol that represents the infinite spiraling forces of nature. The design seems to symbolize the three patternings of life: birth, life and death; spring, summer and winter; the time before, the now and that yet to come.